Hi + welcome to the beginning of a 9-part series of something I am SUPER passionate about: Branding & Packaging! So I have set out on a mission -- with beautiful logos from some awesome creatives -- to create beautiful packaging ideas to inspire you to send off your beautiful work in a way that will make your brand shine bright & really wow your clients. Stamp all over the kraft paper with your illustration stamp. Wait a few moments for it to dry and then cut, tape, wrap it up. Cut cardstock into a 3" square & stamp with your logo stamp. That's it! Your packaging is ready to wow: who said fast can't be fabulous? Any size doodle will do, but 1' x 1" is a great size if you are wrapping up small products; the box I used in this project is a 4" x 4", for your reference. 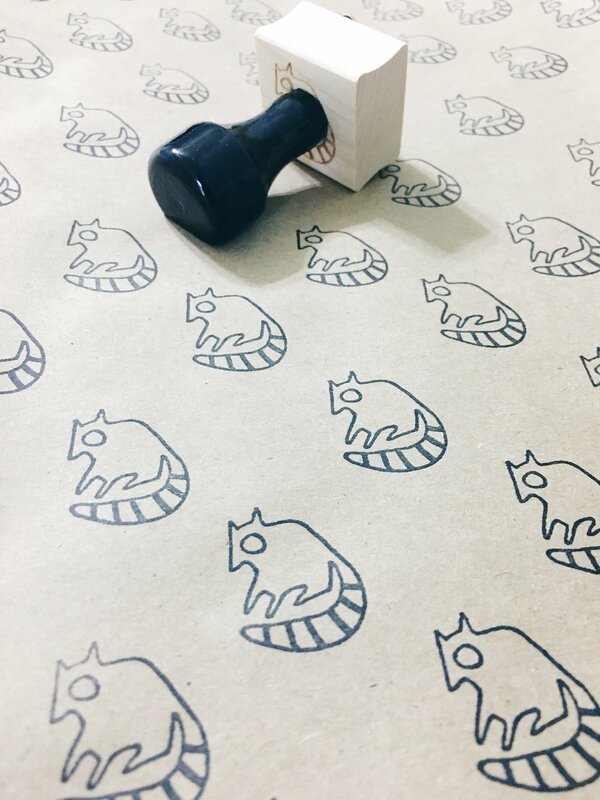 Bonus points if you integrate your URL into your 2" x 2" logo stamp, like Catie did for her brand! This directs customers straight back to you right when they're being "wowed!" See below for a peek at the next packaging project that you could make with the very same stamps: branded ribbon!